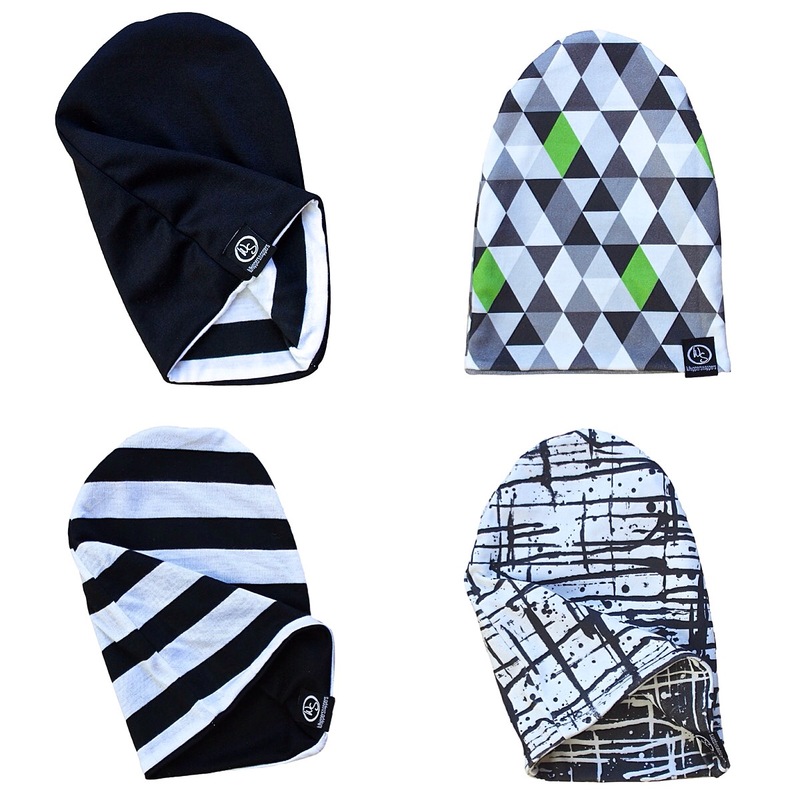 I’ve added a few new patterns for the reversible slouchy beanies!! Available in sizes newborn – 5/6T. Back to smoothie-making for me! 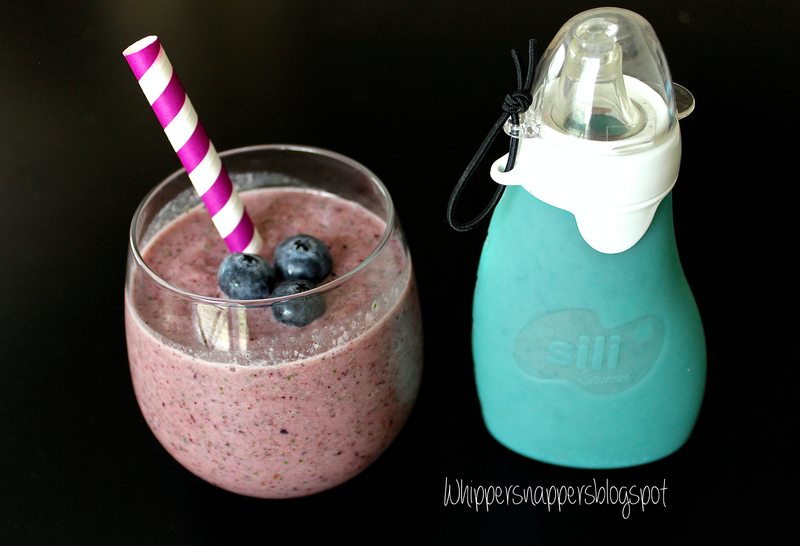 I have gotten so much use out of that Sili Squeeze I got to be able to easily feed my 1 year old smoothies. Definitely got my money’s worth out of that one. He absolutely loves smoothies and loves using it! Except for the fact that I still am not at the point where I can just give it to him and walk away or else he would just squeeze it eeeverywhere! So I still just hold it for him but it’s still way more convenient than using a spoon or just a regular cup and straw. 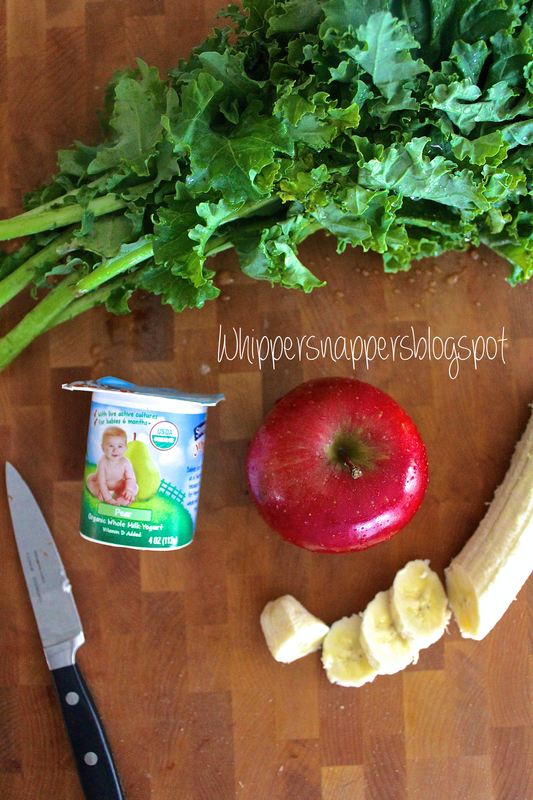 This smoothie isn’t just for babies and kids…I thought it was delicious too! 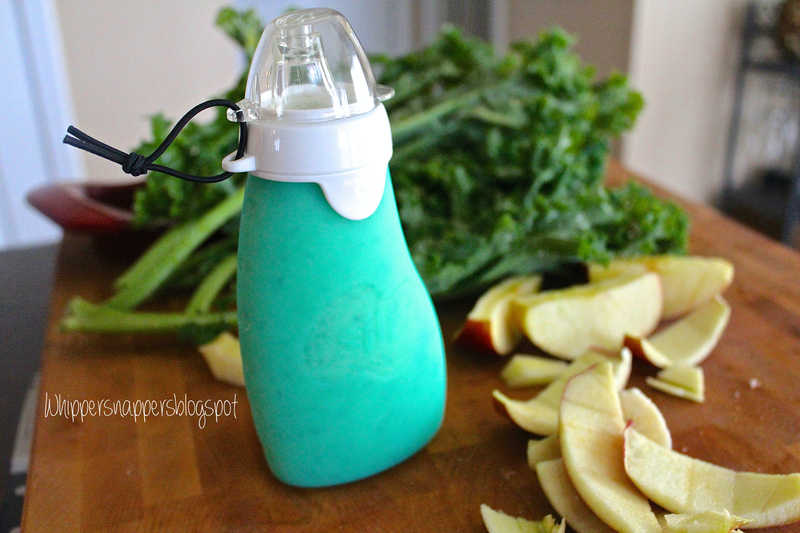 Make a whole blender full and you could share it with the little ones 🙂 And since there is kale in it, even though it looks and sounds so unappetizing, you really don’t taste it so it is super healthy too!! 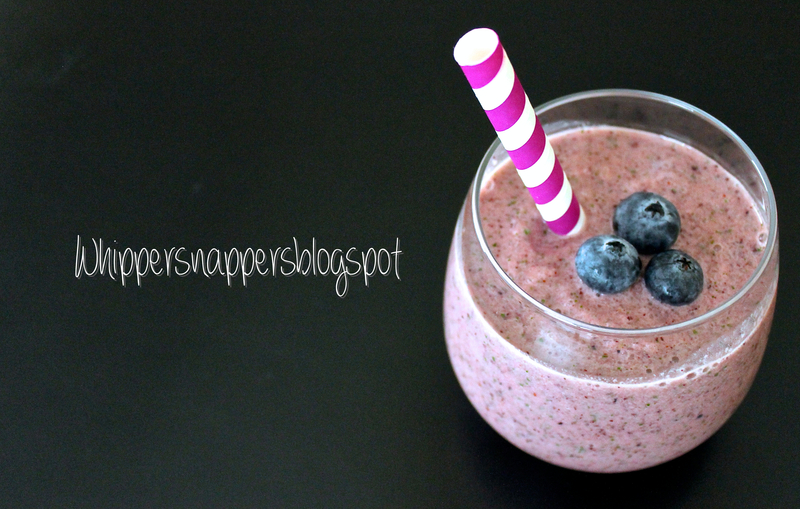 All I could taste was blueberry, pear and yogurt goodness! 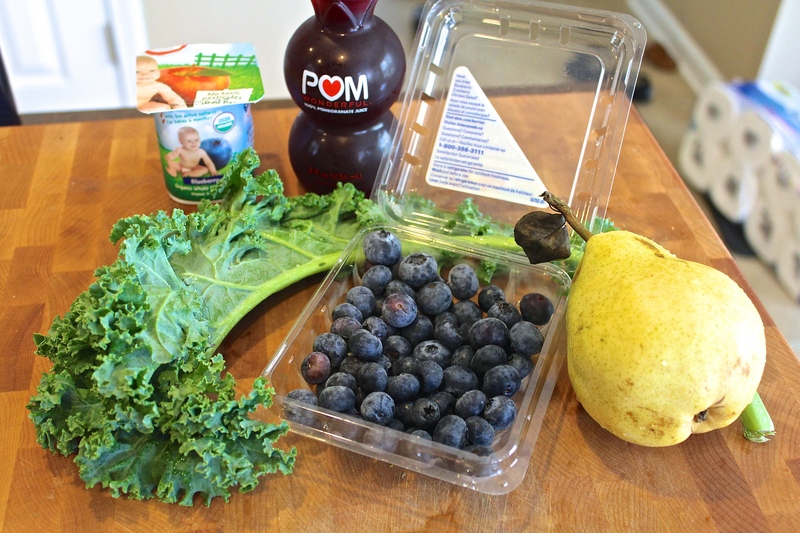 I used 100% pure pomegranate juice for my liquid, which also has many health benefits. Make sure to wash off fruit and kale. Peel and core the pear. Add everything to the blender and blend well adding more pomegranate juice if you need more liquid. This tastes so amazing! 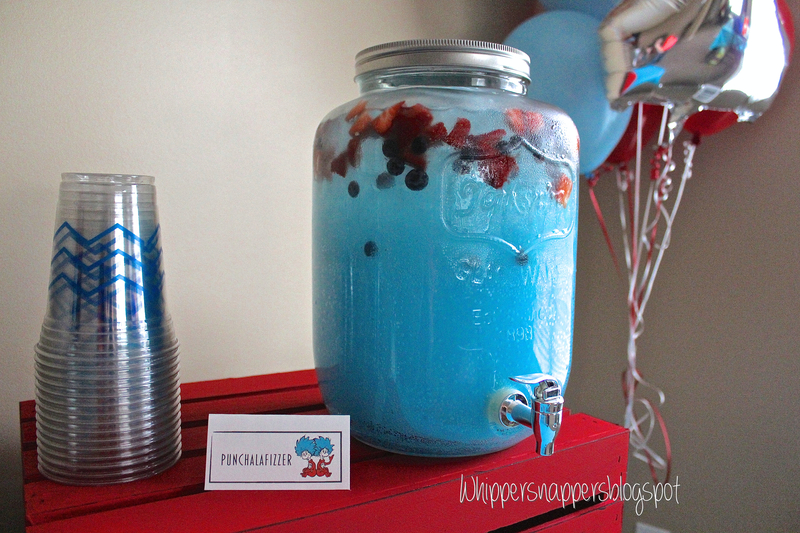 I really think that blueberry and pear is a great combination! 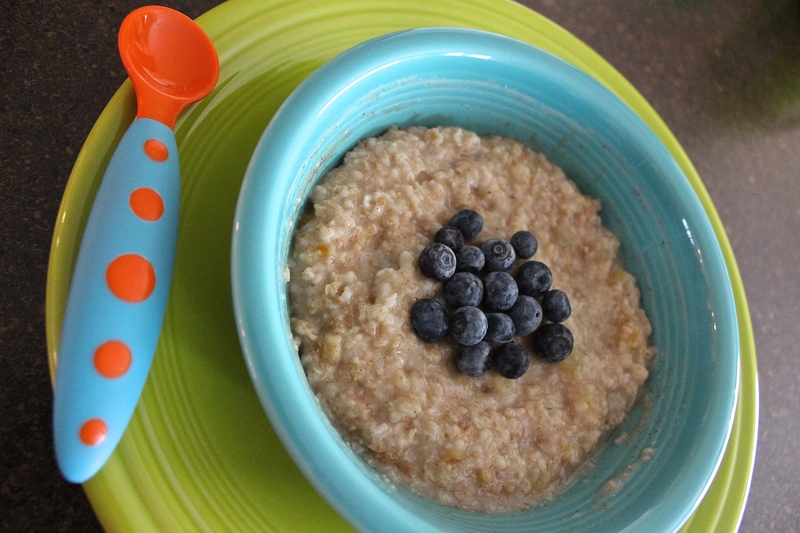 If you have younger babes, check out my Blueberry-Pear baby food puree on my Homemade Baby Purees page. 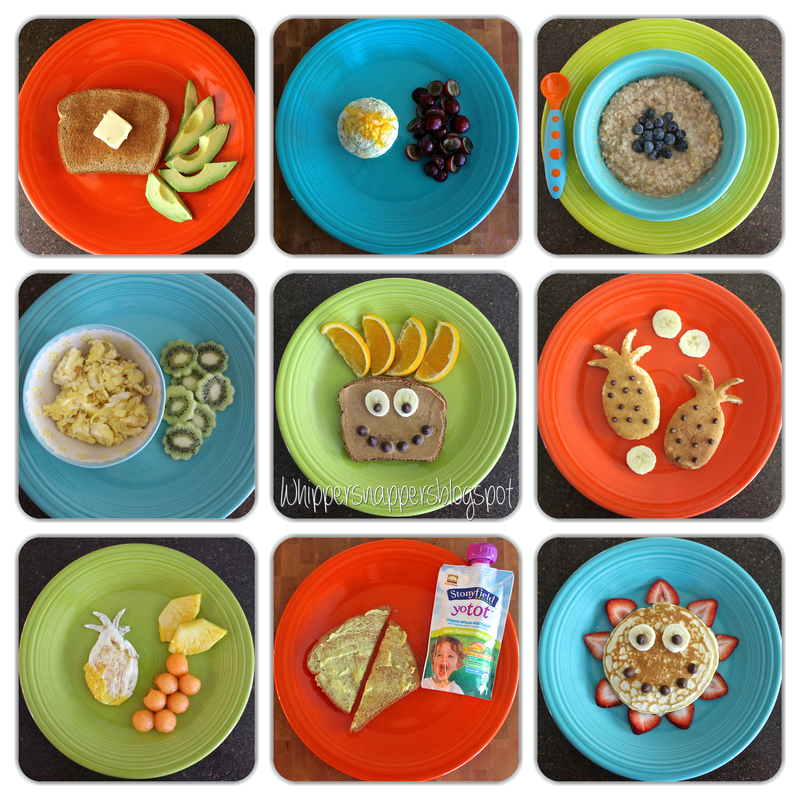 I made this a while back when my son was still itty bitty and he loved that combo even then too! 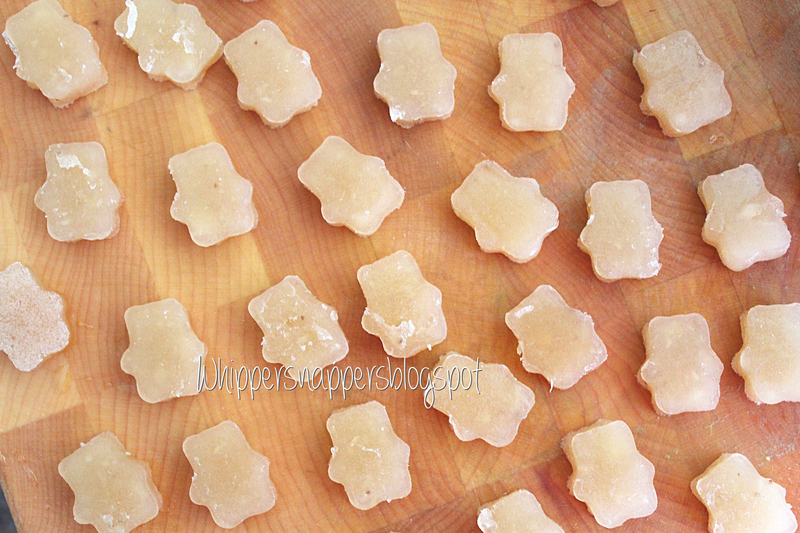 Banana – Coconut Homemade Gummy Bears! 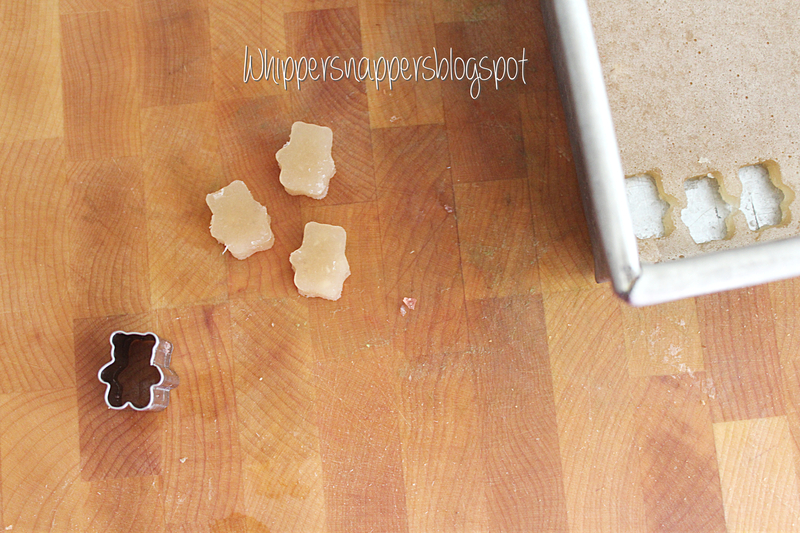 I whipped up these banana-coconut gummy bears at the same time I made my strawberry-pomegranate gummy bears and am finally finding the time to write about it! 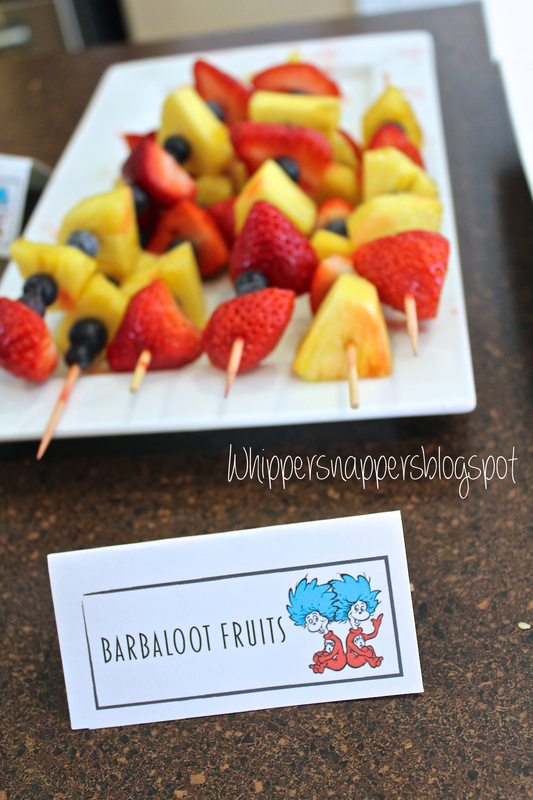 Find the strawberry-pomegranate gummy bears HERE if you are interested. 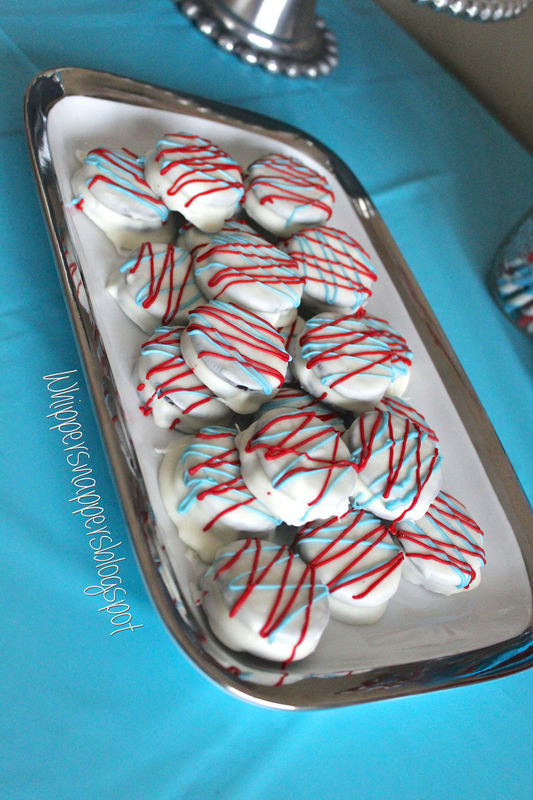 These actually became somewhat of a joke in our house since my husband and I were digging into them just as much…they are quite addicting! 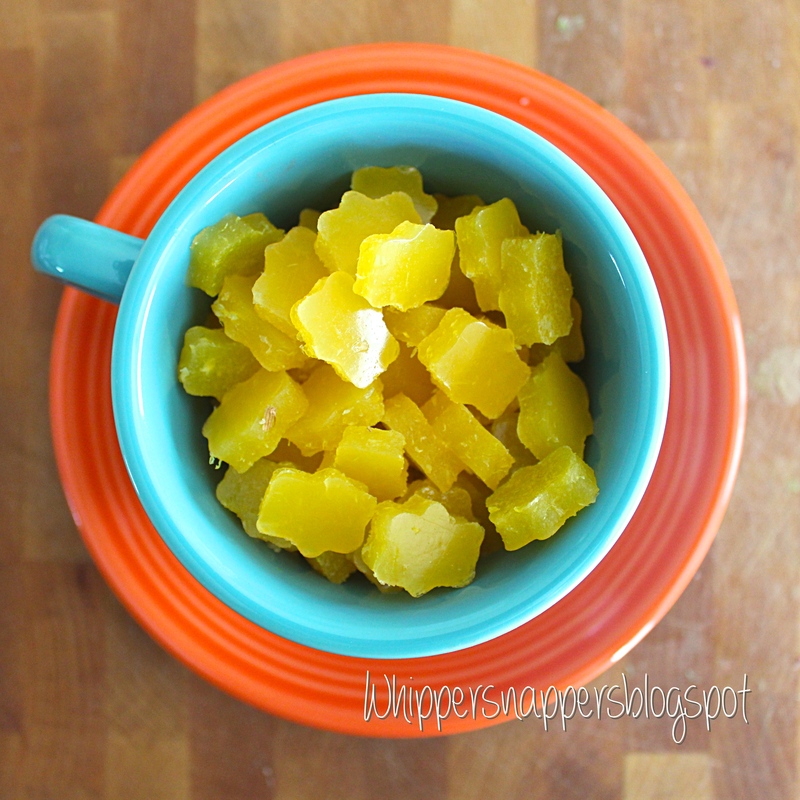 -1/2 Cup Pineapple – Coconut water (plain coconut water would work just fine). Add 1-2 bananas to the blender (depending on how big your bananas are and about how much will make 1/2 cup pureed) and puree until very smooth. Add a small amount of water if needed to puree smoothly. Cook coconut water and gelatin powder in a saucepan over low heat until the powder has dissolved (4-5 minutes) while stirring. Do not let mixture come to a boil. After the powder has dissolved take the liquid off of the heat and slowly add it to the banana puree while stirring. Add honey and stir until combined. 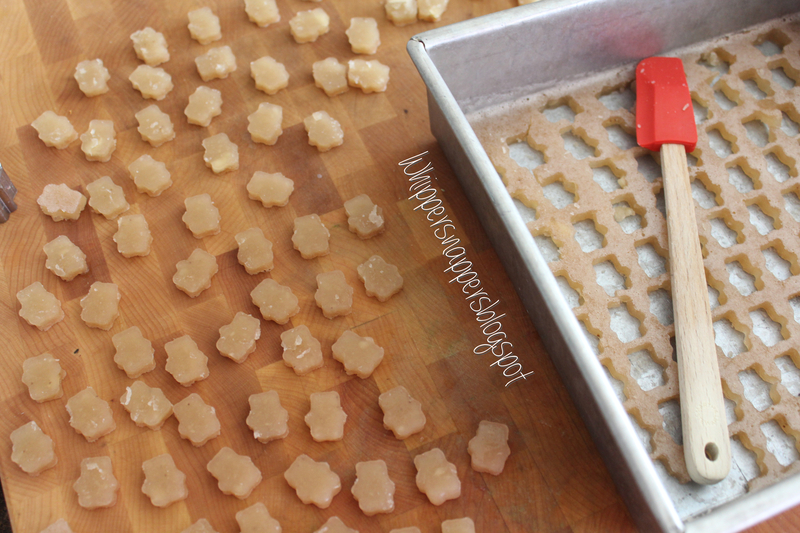 Pour the mixture into a pan or gummy bear molds. If you use a pan you want to use a size that will make it so the liquid is fairly shallow. An 8×8 or 9×9 inch pan would work well. 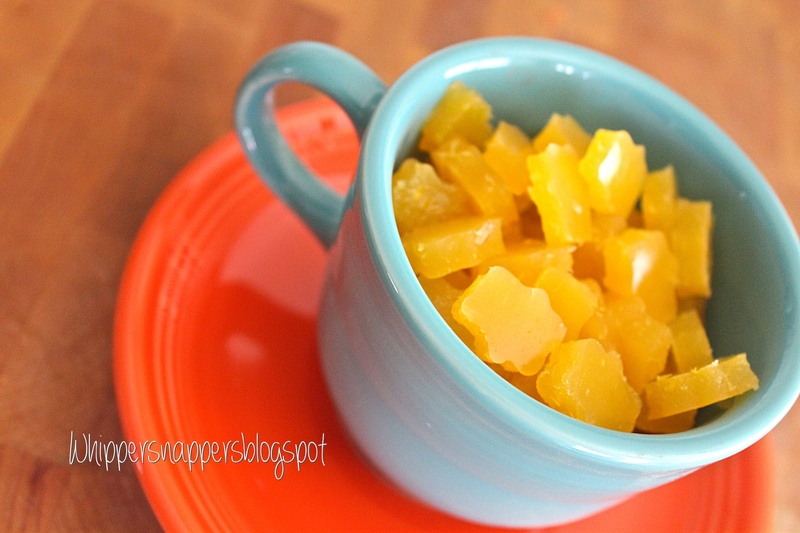 I did find that these did not last as long as the other gummy bears I had made. Bananas kind of get gross if left out so I suppose the same things happens when in gummy bears! They last about a week or less in an air tight container in the fridge. I have recently added the new tops to the Whippersnappers Etsy shop! There are now two new colors in the submarine tank and a few more completely new designs. Soon to be added will be handmade leggings, harem shorts, top knot headbands and slouchy beanies. It has been a process getting everything that I want in my shop up and ready but I am excited that it is all coming together. Click HERE or you can find my Etsy shop by clicking on the “Etsy Shop” tab in the main menu of the blog. 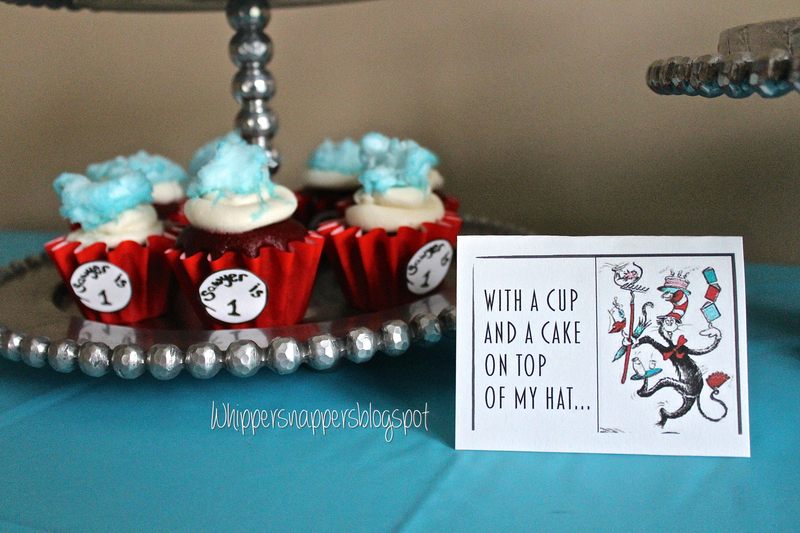 Dr. Seuss – Cat in the Hat – 1st Birthday Party! 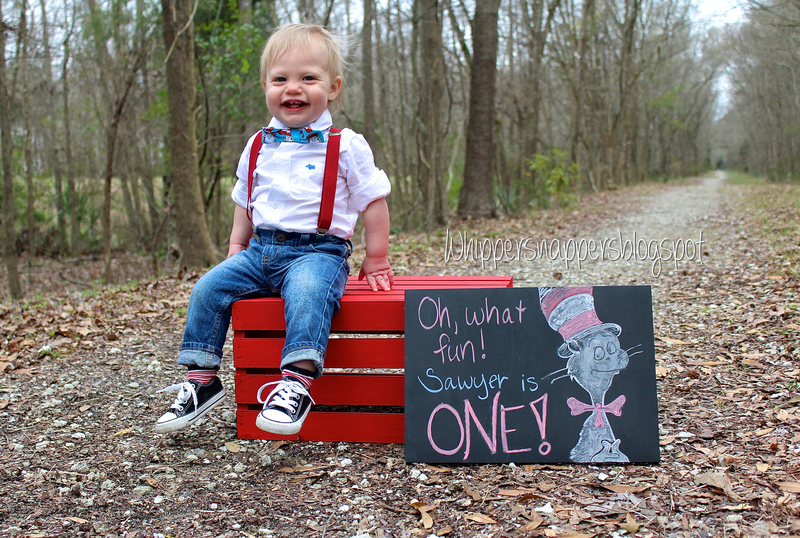 Oh what fun, Sawyer is one!! This is a bit overdue since he turned one on the 10th but I figure, better late than never! 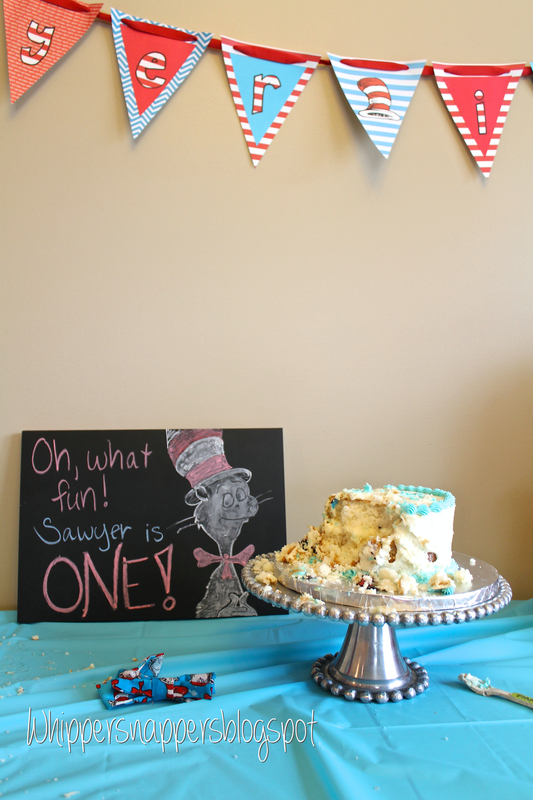 We had a blast throwing Sawyer his very first birthday party! It was so much fun since both sides of grandparents could both come! With living so far away from everyone, that sure doesn’t happen very often! You could really tell that Sawyer was loving all of the attention, almost like he knew that the day was all about him. 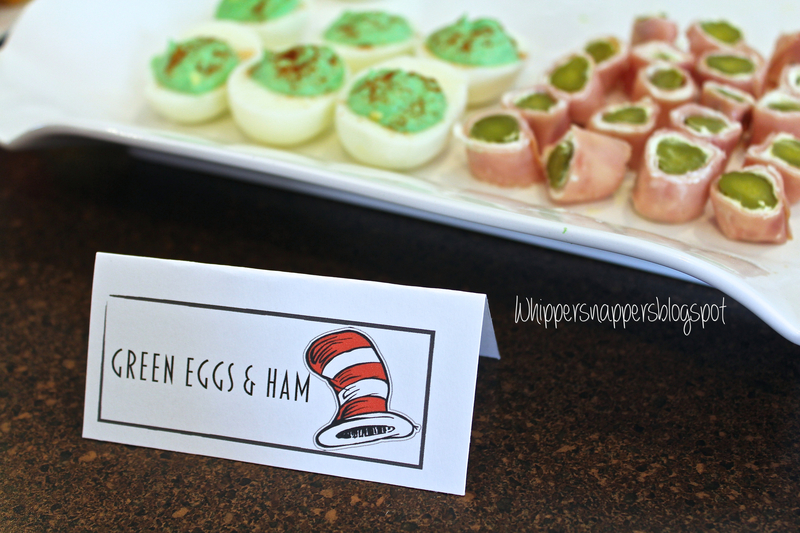 I knew that I wanted to do a Dr. Seuess – Cat in the Hat theme because he has so many of the books and loves the “Cat in the Hat Knows a Lot About That” TV show. He grins and dances every time it comes on! 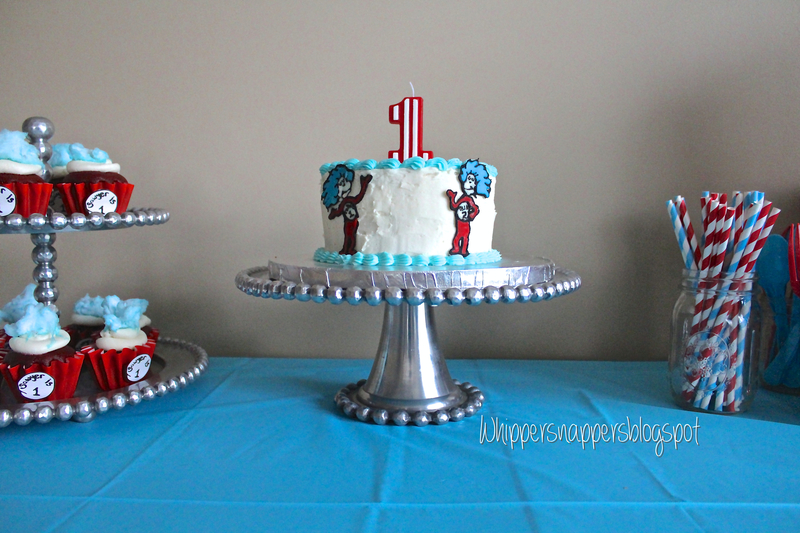 For the cupcakes I made Thing 1 & Thing 2 inspired cupcakes. The use of cotton candy for blue hair wasn’t really my own idea…I had seen this on Pinterest a few times! I made red velvet cake and a vanilla buttercream icing toped with blue cotton candy. 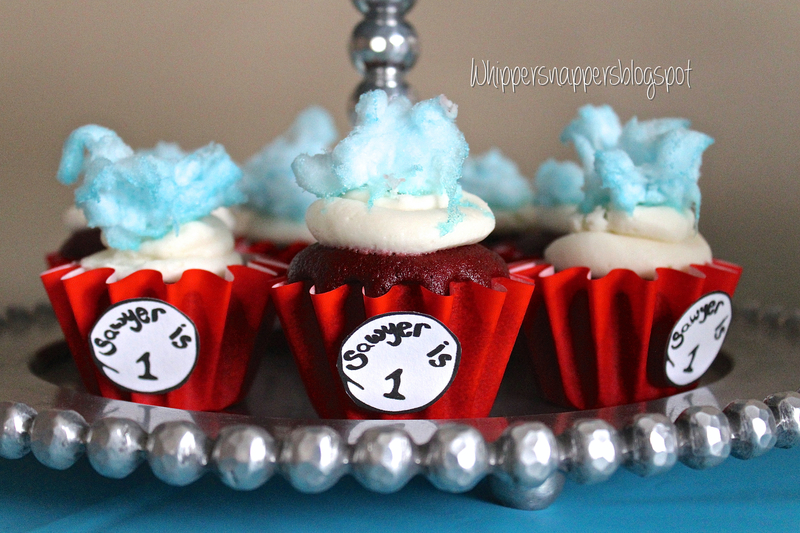 Then glued on little circles to the paper but instead of saying Thing 1 & Thing 2 it said “Sawyer is 1.” Little tip, if you ever want to make cupcakes with cotton candy on top, make sure to put the cotton candy on shortly before serving. Luckily I did this so it worked out okay but after sitting for awhile the cotton candy kind of just dissolves into blue crystals on the cupcakes. This oddly enough worked out and gave it a nice texture anyway! I think it just depends on what the humidity is at and the fact that it is sitting in icing. 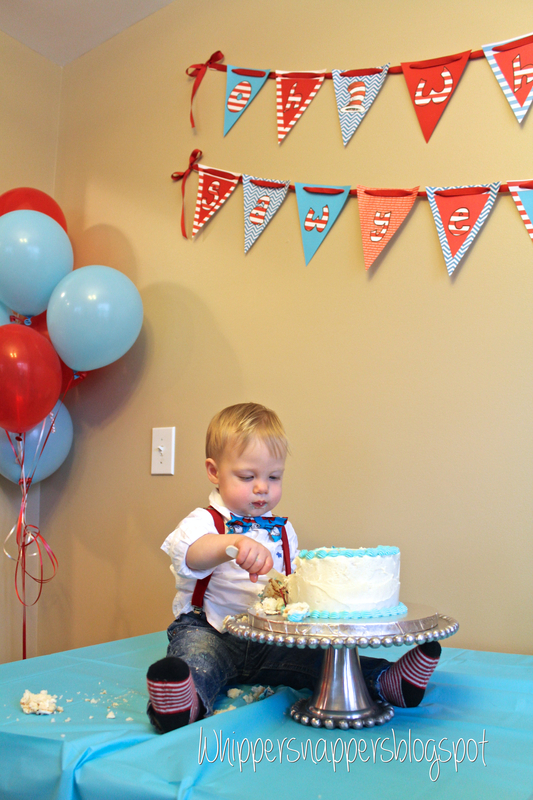 For Sawyer’s smash cake I made a white cake (Okay, I’ll admit it, I used boxed cake! But hey, I didn’t have a lot of time and to be honest, I think boxed cake tastes delicious!) iced with vanilla buttercream. For the buttercream I just used 1 C butter, powdered sugar, 2 tsp vanilla and milk. For the powdered sugar and milk I didn’t really measure. I just added until it all mixed together with a good taste and consistency. 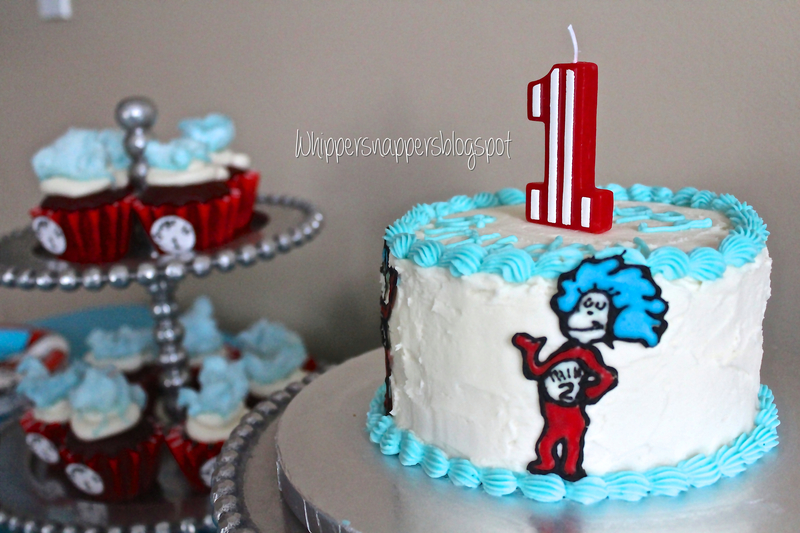 I made the Thing 1 & Thing 2 characters by melting white chocolate and adding color to it. The chocolate tends to harden back up a bit when you add food coloring so I added just a tiny bit of coconut oil and it melts it right back up really smooth. I had printed the characters out on paper and layed wax paper over top so that I could see the characters through it. Then I just piped the melted chocolate on the wax paper tracing the characters. I wasn’t sure if it would turn out or not but they ended up looking great! 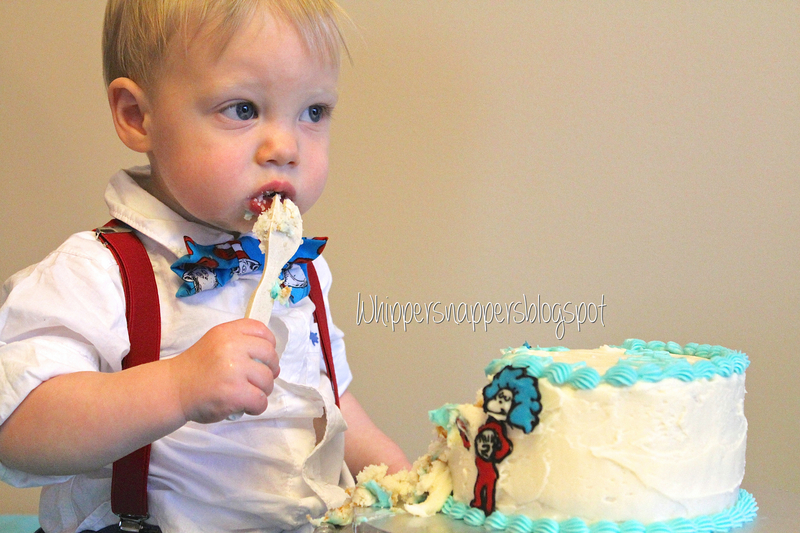 The funniest part about the whole party was Sawyer eating his cake! We literally just sat and watched him for so long! We sang him Happy Birthday, blew out his candle and then gave him his cake. I kind of expected him to be a bit iffy about it because he doesn’t like getting gooey things all over his hands. But I mean c’mon, it’s CAKE! So I thought he’d be diving in at least a little! Nope, after nearly poking it he already has a completely disgusted look on his face! My husband goes and grabs a baby fork and to my amazement he actually uses it! He sits there and eats his cake with a fork! I love that little stinker so much! Today is my son’s very FIRST birthday!! 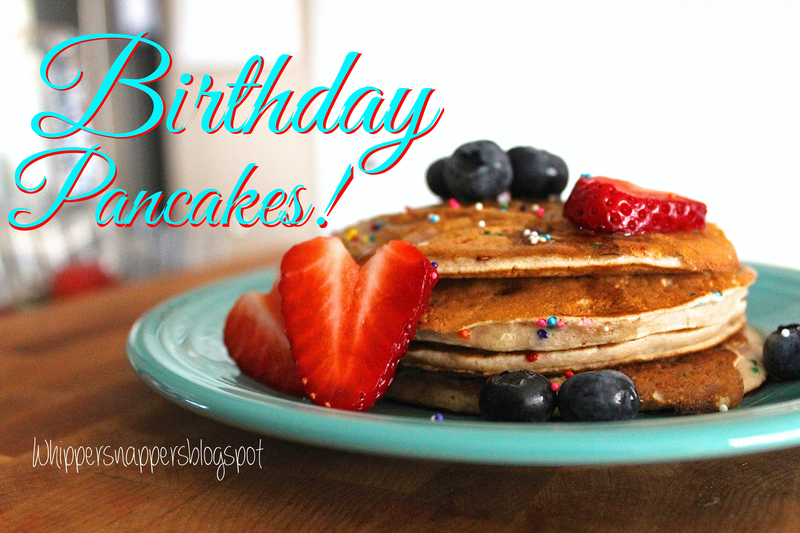 I wanted to start out the day extra special by making him some birthday pancakes! For the pancakes I just used a simple plain pancake recipe from FoodNetwork.com found HERE. Beat all ingredients together well. Heat up a skillet sprayed with non-stick spray. 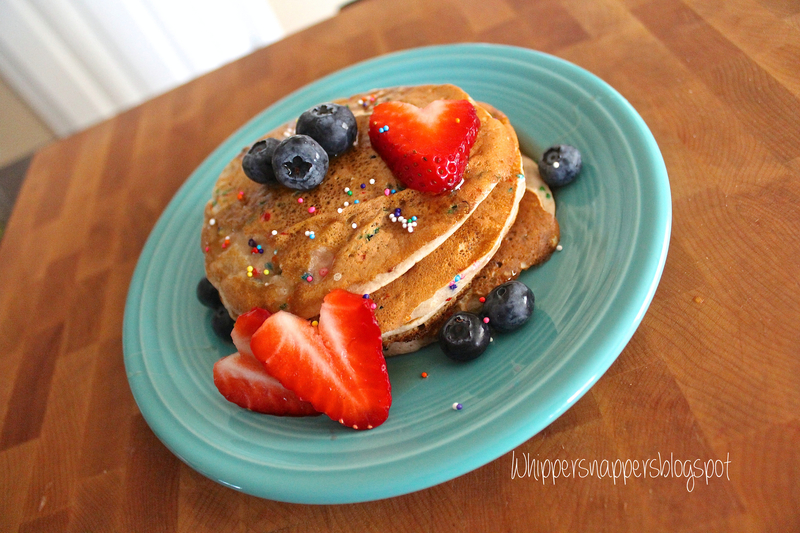 Pour small amounts of pancake batter into the pan at a time. 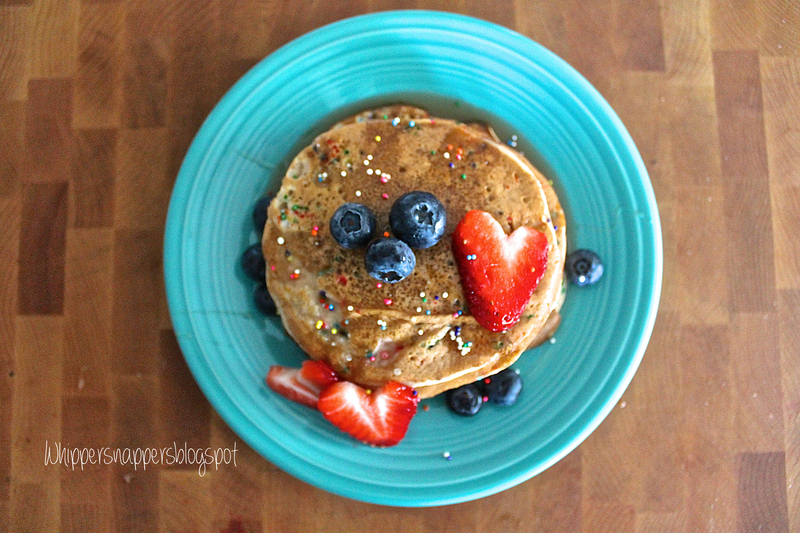 I added sprinkles to each pancake. 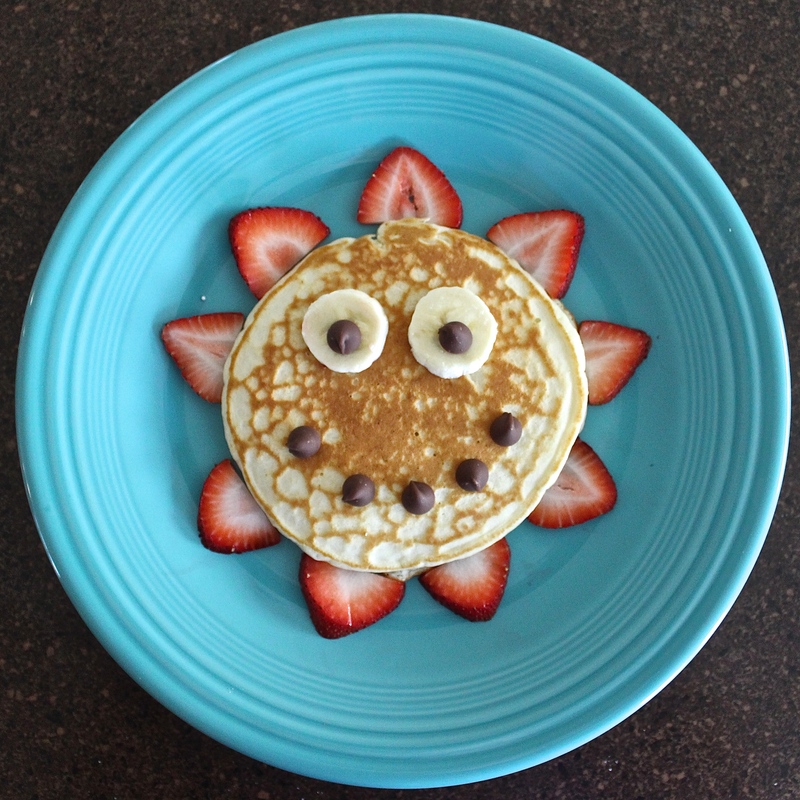 Add whatever fruit or toppings you would like! I chose strawberries and blueberries! 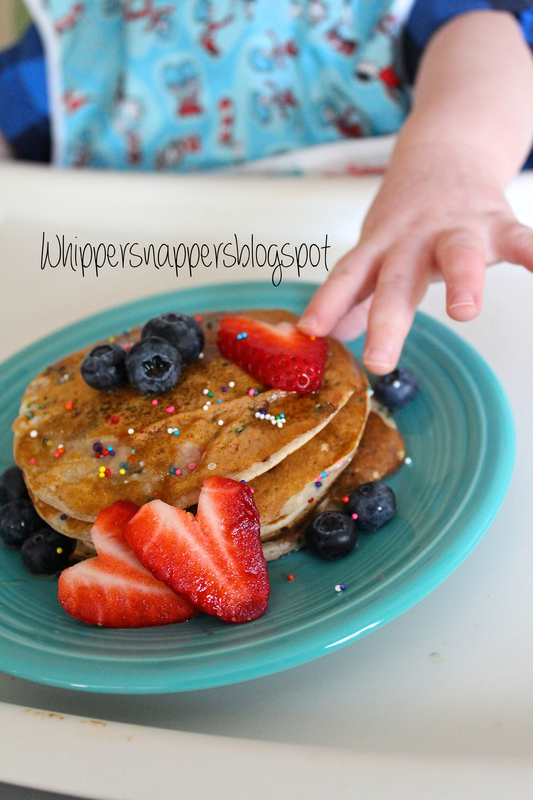 Blueberries are my son’s absolute favorite so he of course picked all of those off right away! I think he would just continue to eat blueberries for as long as I gave them to him! For the syrup I reduced pomegranate juice (bring to a simmer until it reaches a syrupy consistency) then added maple syrup for a pomegranate maple syrup. I had never tried this before (usually just stick to good ol’ maple syrup) but it was really delicious! 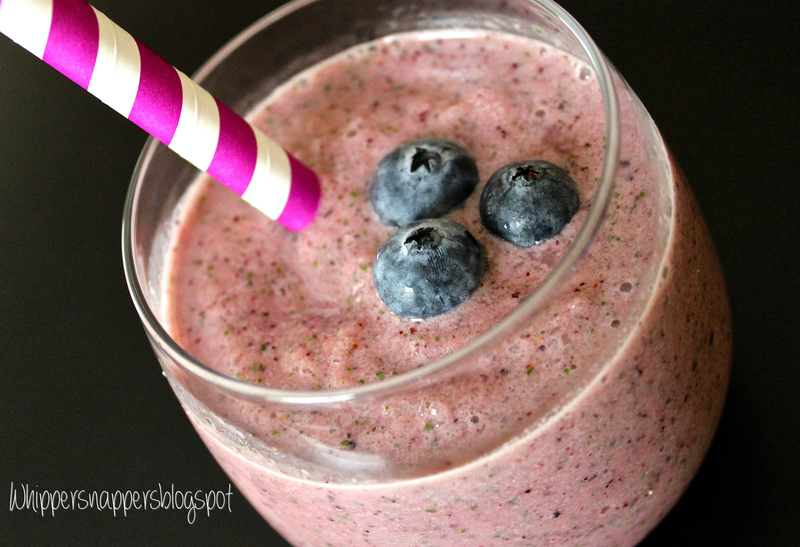 Smoothies have been a great go-to lunch option lately! Of course, I’ll admit sometimes it is much easier to throw together a quick sandwich or hotdog but most of the time I try to be more healthy and my son is my biggest motivation for that! So…GREENS! 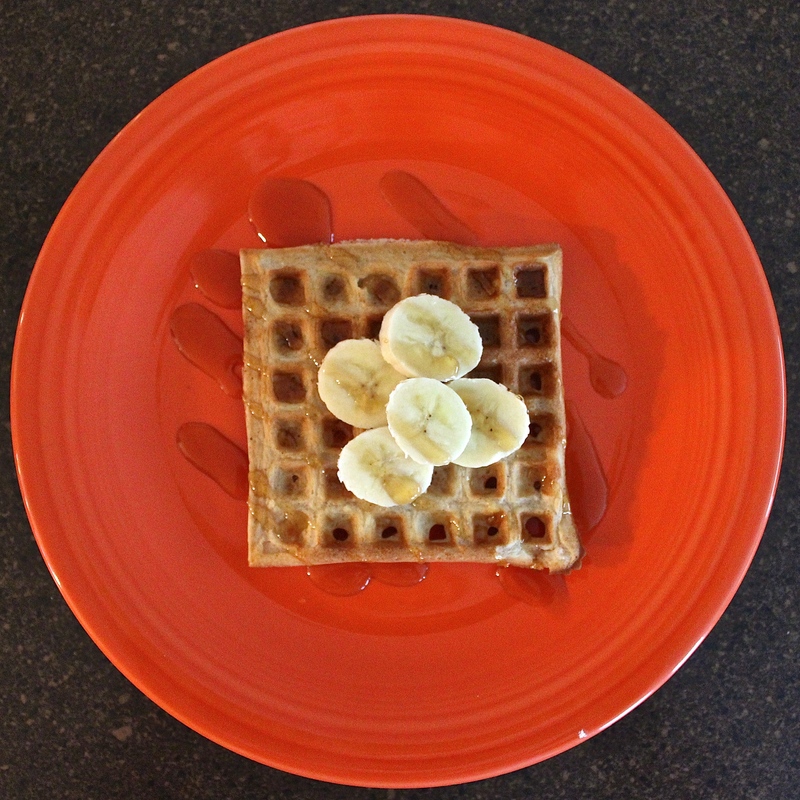 Super hard to get kids to eat, right?! Turn to smoothies, it will work! Even smoothies that are visibly green or maybe even a little gross looking are some of the tastiest smoothies! Throw some spinach or something in a smoothie and you really can’t even tell at all! Needless to say, don’t even mention that it’s in there and they won’t even know! 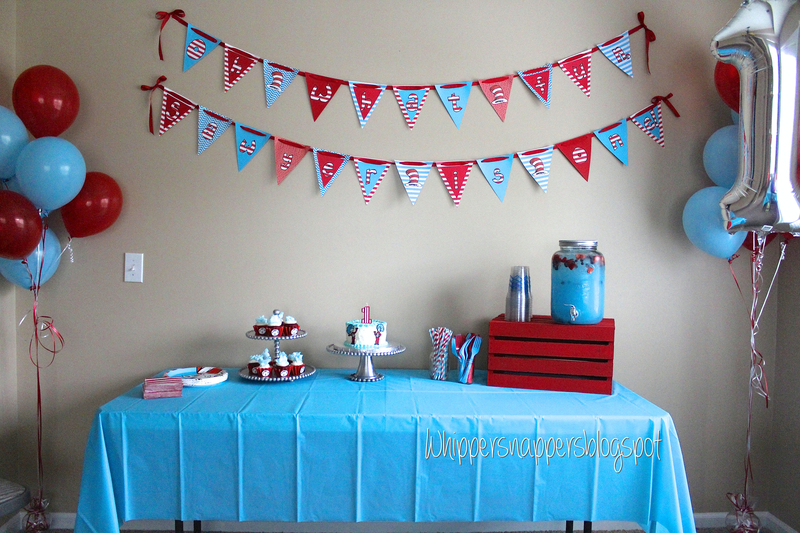 I whipped up this one the other day, kind of just trying to use stuff I had around the house. 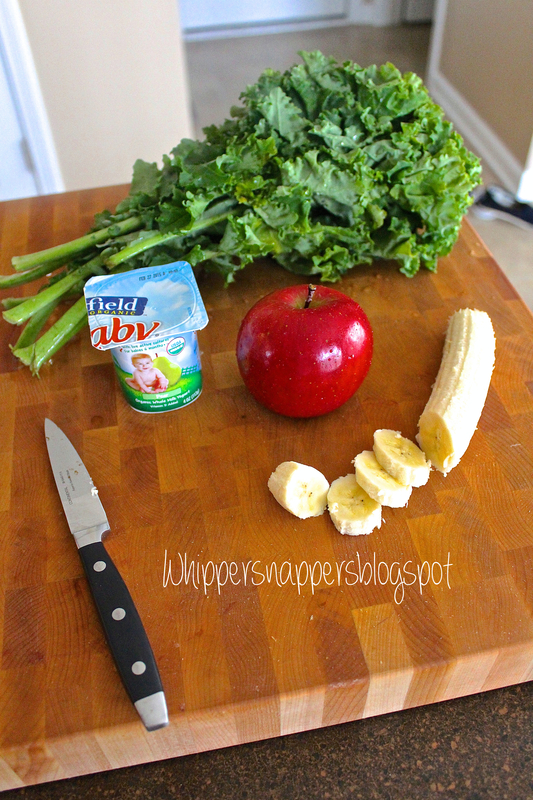 I realized that for some reason I have never used apples in a smoothie before. I don’t know why because it sounds great to me! 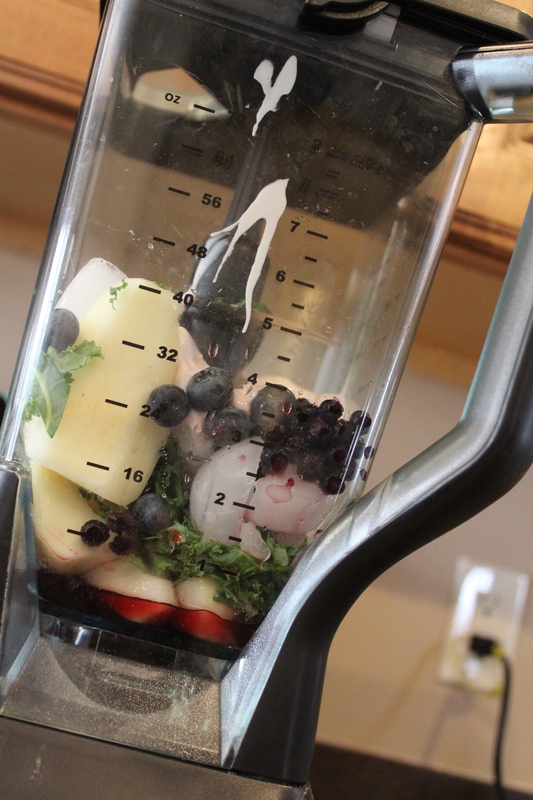 Add everything to the blender and blend well!! 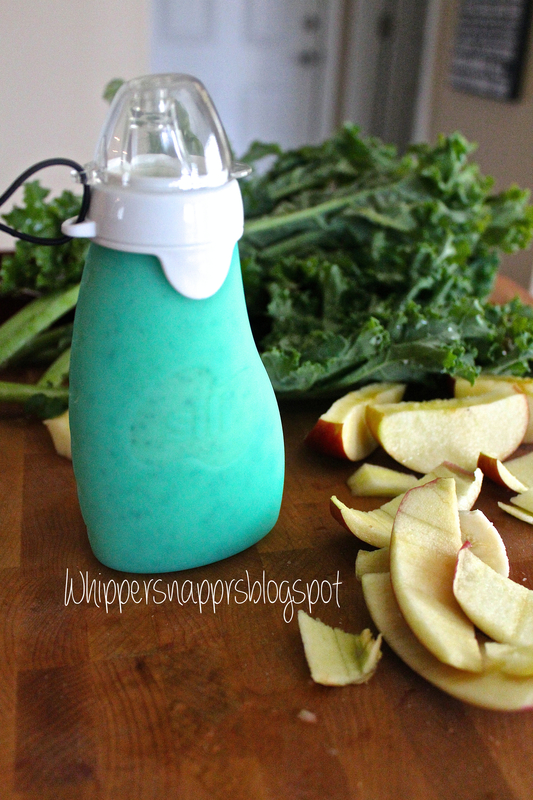 Try this one out, the apples are great in it! 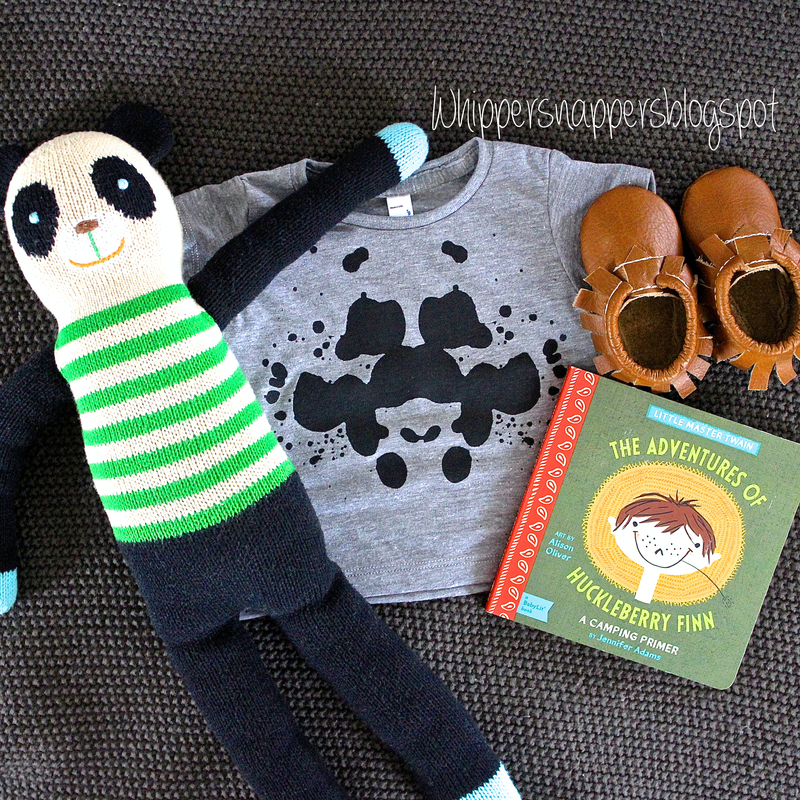 What I am about to say, I still can’t believe…Sawyer is starting to walk! WALK! Okay, how in the world did that happen?! Wasn’t I just bringing him home from the hospital? It is only a week and a half away from his first birthday. No doubt, that will be an exciting yet teary day! The dvd’s is a big thing to get into right now. They are low and easy to access and I haven’t thought of a new place to put them. To be honest, half the time I just let him pull them all (and I do mean ALL) out of the shelves and play with them. I mean, he’s sitting there entertained for a good amount of time and not harming anything…go for it! But the other struggle, dog food. Oh my goodness the dog food!!! Is anyone else’s child obsessed with dog food?! We have a huge great dane so his bowls stand up from the ground. It all started with him standing up to the bowls and digging his hands all in his food and putting it in his mouth. Gross. So finally I’ve been putting the bowls up if he is venturing around and playing. So that helps. But now the problem is he somehow finds any itty bitty piece of dog food crumb on the flood. Doesn’t matter how much I sweep or vacuum. He will find it! And yet, won’t touch the perfectly clean and cooked peas I try to feed him, go figure.